The Callaway Hybrid Rangefinder is the peak of distance-measuring performance; the convenience of a GPS and the power and precision of a laser all rolled into one spectacular product. Also included with your purchase is a carry case with carabiner, a sleeve of Chrome Soft golf balls, a divot tool w/ball marker and a 3V Battery dual pack. 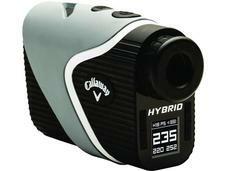 If you have any more questions about the Callaway Golf Hybrid Laser-GPS Rangefinder; do not see the model you are looking for; need custom options; or prefer to not purchase online, then please call us at (630) 656-1291.